A Reading Writer – I write because I read. I read because I write. touching the tendrils of love’s blurry profile. proving this big, big world is our residence. ©2019 Rosemawrites@A Reading Writer. All Rights Reserved. until I am onboard my only heaven-bound boat. this earth will crumble, disappear. Will you let your story end here? choosing to leave peace’s hemisphere. while fragile buds still persevere. more hands now filled with bloodsmear. but you can be: change’s pioneer. please don’t let your story end here. Inspired by dVerse Poetics: Water, Water Everywhere . Inspired by dVerse Quadrille #77 – Ace of Poems. Words are the gifts I have always wanted for myself. my calorie-free slices of cheesecake. My words is the gift I can give to the world. 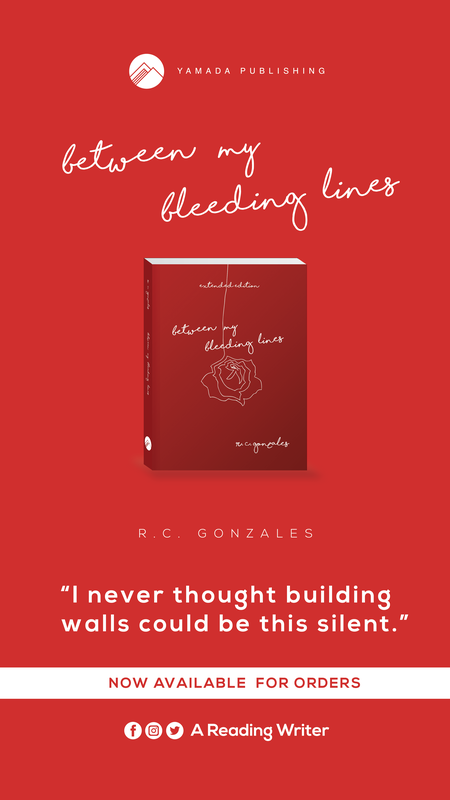 ©2019 R C. Gonzales | A Reading Writer. For NaPoWriMo 2019: Day 7. What do you deserve? Name it. All of it. What are you ready to let go of? Name that too. Then name the most gentle gift for yourself. Name the brightest song your body’s ever held. Summon joy like you would a child; call it home. It wanders, yes. But it’s still yours. of miles for its lunch. man, with mane so blond. For NaPoWriMo 2019: Day 3.
on left it’s a strawberry jam of red. For NaPoWriMo 2019: Day 2. Today’s prompt (optional, as always) is based on this poem by Claire Wahmanholm, which transforms the natural world into an unsettled dream-place. One way it does this is by asking questions – literally. The poem not only contains questions, but ends on a question. Today, I’d like to challenge you to write a poem that similarly resists closure by ending on a question, inviting the reader to continue the process of reading (and, in some ways, writing) the poem even after the poem ends. Sip those sunsets, time isn’t bottomless. while your soul sinks with ‘nother day’s eggress. Sshh, be still, as evening sky undresses. Let that cold wind kiss your deep dark tresses. Tired feet, be bare, let dusts be your toes guests. Shh, be still, as evening sky undresses. Solace’s not a clear map, it’s a wild quest. tough, thick skin is formed with sharp thorns’ scratches. You’re never lost, this earth is your address. scars of blood-golds, only you can possess. Yes, you’re never lost. This earth’s your address. Sip those sunsets. Time isn’t bottomless. Inspired by dVerse Poetry–a Piece of Written Art. The pantoum is a poetic form derived from the pantun, a Malay verse form: specifically from the pantun berkait, a series of interwoven quatrains and rhyming couplets. It is similar to a villanelle with repeating lines throughout the poem. It is composed of a series of quatrains; the second and fourth lines of each stanza are repeated as the first. The pattern continues for any number of stanzas, except for the final stanza, which differs in the repeating pattern. The first and third lines of the last stanza are the second and fourth of the penultimate; the first line of the poem is the last line of the final stanza, and the third line of the first stanza is the second of the final. Ideally, the meaning of lines shifts when they are repeated although the words remain exactly the same: this can be done by shifting punctuation, punning, or simply recontextualizing. A four-stanza pantoum is common (although more may be used), and in the final stanza, lines one and three from the first stanza can be repeated, or new lines can be written. Nothing, oh nothing, but love.